After reading an article about how one man “cracked” extended play scratch lottery cards, I decided to give it a go myself, armed only with $18 and an abundance of free time. 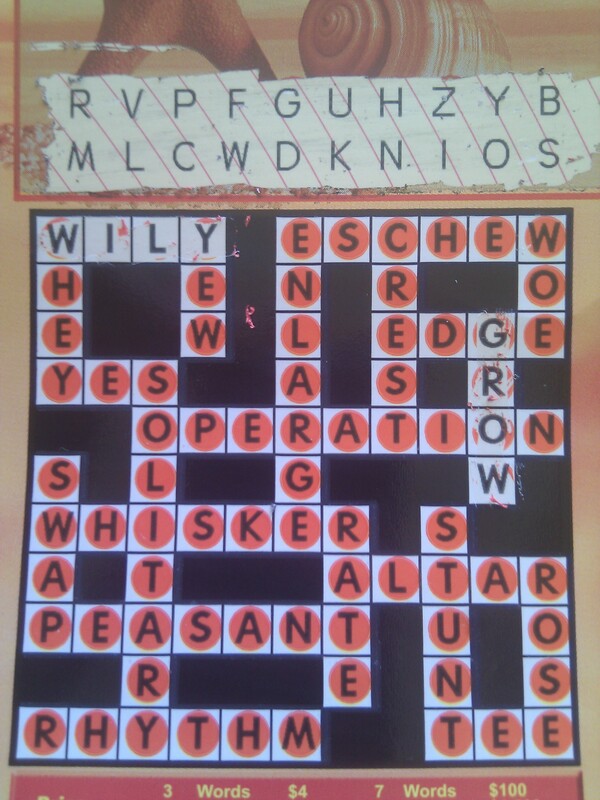 I bought six of SA lotto’s crossword type games and sat down to analyse them. At the top of the card are 20 letters hidden beneath the scratchable area. These are hidden until you buy the card. 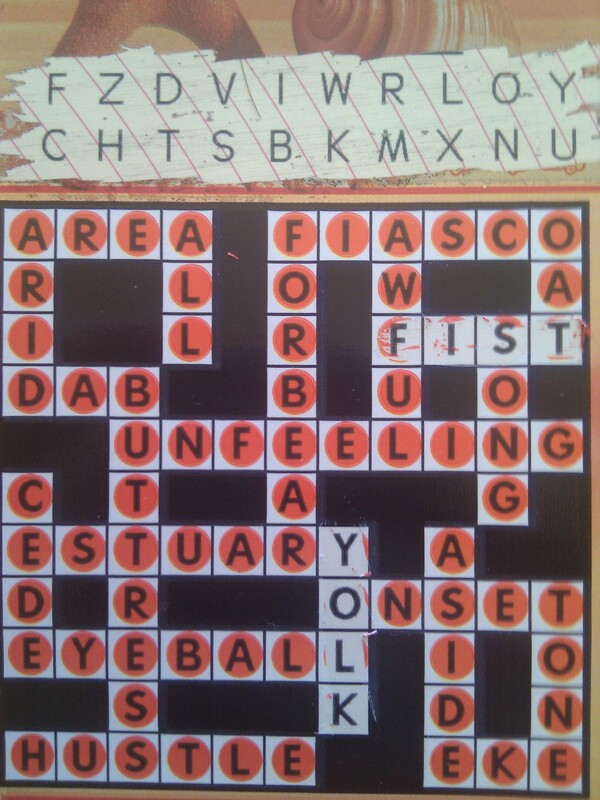 At the bottom of the card is a crossword. This part you can see before you buy it. To play the game you scratch off the letters at the top, and see how many words from the crossword you can “find” using those letters. 3 or more and you win. Because you can see the crossword before you buy the ticket, it could potentially give away information about whether or not the card is a winner. It all depends on the method they use to generate the crossword and the hidden letters in the first place. All that’s needed is a little reverse engineering. I had six cards to work from. Looking at each of the cards I found that they all had 10 “across” words and 11 “down” words (21 words in total). Each card also had the 20 letters to scratch off, the key to the puzzle. I spent some time with a pen and paper looking at things such as the frequency of each letter on the various cards, but i was getting nowhere – time to switch to the computer. So if I was designing this scratchie ticket system, how would I go about it? 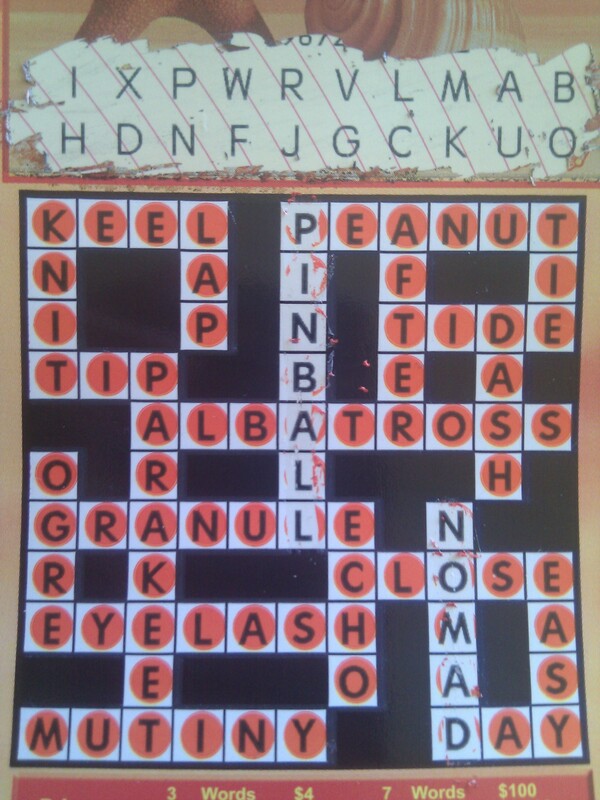 The key to the puzzle is the 20 scratchable letters. Taking the 6 crosswords available to me, could I generate a new set of 20 different letters that would make them winners? Or losers? If I couldn’t then there might be a flaw in the system that could be exploited. “Pinball”, “nomad” and “lap” are the only words we can make. You need three or more words to win, so here we have won $4. If we can’t come up with some different combination of 20 letters that will make this card a loser, then that would make this card identifiable as a guaranteed winner – without having had to scratch off the numbers first. This is easy enough to do, we simply replace the “i” that makes up “pinball” with a “z” and we have a loser (of course all the “loser” cards I found had two words made, to make people think they had almost won). Being me, I had to go into overkill mode and work out exactly how many different loser combinations there were for each card, so I wrote a program to do it. It turns out that there are 2395 different losing combinations for this card (meaning only two words made). This is bad news for us. It means that we can’t look at the just the crossword to find out whether a card is a loser, and therefore decide not to buy it. But what about looking at things the other way around? The grand prize for finding ten words is $100,000. If we can’t take a losing card and generate 20 letters that turn it into a grand prize winner, then we might be able to narrow the field down. We could identify which cards are definitely not grand prize winners, and only buy cards that have a real chance. Depending on the numbers, this might pay off. For example if only 1 in 1000 cards are identified as potential grand prize winners (before buying them), and 1 in 500,000 cards are actual grand prize winners, then we’d only need to buy 500 cards to win (on average). At $3 a card that would cost $1500, giving us a tidy profit of $98,500. So can we do it? If we can turn any old loser card into a grand prize winner just by picking different letters, then the answer is no. So that’s what I set out to do, using my bag of tricks. Here’s one of the cards I looked at. It turns out the letters abdefhiklopqstuvwxyz could make this a grand prize winner (try it), along with 2886 other different combinations of letters. Sorry to disappoint folks but it looks like the system is sound, and this scratchie system isn’t easily crackable. Of course there still might be some flaw in the way they specifically generate the cards, but it looks at least possible to create an uncrackable system using this crossword-and-20-hidden-letter scheme, as it appears that each card can be easily switched from a winner to a loser or vice versa just by changing the hidden letters. At least I had fun investigating it. And in case you are wondering, of the six cards that I bought, 2 were winners. Or so I thought. I took photos of them all for later analysis on the computer and threw the “losers” out. Later when I actually did the analysis, I found one more winner I had mistakenly thrown out. Let that be a lesson to you all – in gambling, even when you win, you lose. Nice one! And yet, every four weeks or so, I still wander in and buy a quick pick lotto ticket…..
You left out the bit where you gave them to us and we spent them on ice cream. You also left out the bit where the designer of the crossword ticket system is paid enough to ensure that the system is neither flawed, nor seen to be, thereby protecting the lottery house’s $100,000 (plus extra prizes). Also left out is the part where the tickets come off of a roll and aren’t available for individual selection prior to purchase. So, given the life span of this particular game, would it even be economically viable to a) hang around ticket dispensaries waiting for someone else to buy that particular ticket (the lottery houses frown upon this activity and encourage store owners to shoo ‘hanger-arounderers’) or b) travel to every dispensary in order to ‘check’ each ticket. I would say that the answer to a) is no, because of the high likelihood of getting apprehended and losing track of the tickets coming off the roll (if you decided to target a particular dispensary). However, I propose that the answer to b) is “yes, but” as in, a little lateral thinking is needed here. If you can get your system to narrow down the odds, even marginally, you could train a team of people to recognise a likely winner and make decisions about purchasing tickets to lower the odds and increase your chance of winning. You are then sharing the $100,000 between more people and increasing your outlay (and, sadly, your chances of getting shafted), but some money is better than none. Hope you enjoyed the ice cream. The designer of the ticket system might get paid well, but that doesn’t mean they can’t make mistakes or not do their job thoroughly enough. As happened with the american longplay ticket system which was found to have a flaw. And as for the tickets coming off a roll, that’s just practical details, I’m more interested the mechanics of the game. But just to play “dr evil” for a bit, you left out “option c” where I collude with a ticket vendor and (for a cut) they let me scan the whole roll, pick out the winners, and then they sell the losers back to unsuspecting punters. Nice piece of advice. Anything to help me pick up some extra cash! The best way it appears is to rely on bonus bit. If they all share the same single letter and its abundant in most words, you won’t be getting a bonus word. So look for a scratchie with uncommon letter (relatively), where it has a semi common vowel, but in words which contain a more common vowel. Eg. Most I’ve had have an abundant I or O in almost all words, and you aren’t given it, therefore you miss most words by 1 or 2 letters. But half the time I usually get the bonus word as it’s the only 1 of 3 which which doesn’t contain that key letter.